Hello, foodie friends! Today, I’m guest posting for Jen of the adorable, creative and always tasty blog, The Three Little Piglets! She and I share similar passions for easy, budget friendly and enjoyable food, and I think you’ll really like what she brings to the table. To get the recipe for my fresh and flavorful Mediterranean Cucumber Cups, click below or visit my guest post at Jen’s blog here. 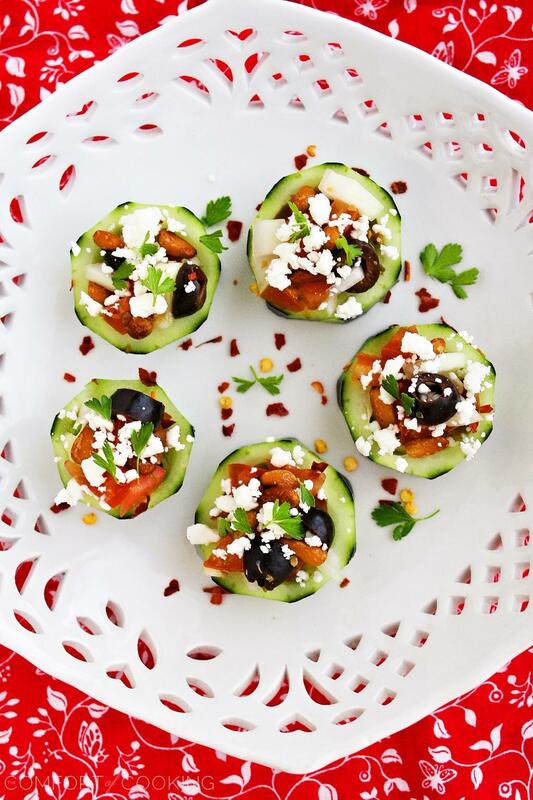 These little cuties stuffed with a Greek-salad style mixture make for a very tasty party treat and a healthy spin on traditional finger foods. They’re also plenty easy and quick to whip up for a springtime party! It’s also time to announce the four giveaway winners of last Friday’s Sokenbicha giveaway! Congratulations, ladies, and thank you so much to everyone who took the time to enter! Have a happy Monday and a nice week, everyone! In a large mixing bowl, mix together the onion, bell pepper, tomato, olives, oregano, feta, parsley, lemon juice and zest, and olive oil. Season with salt and pepper, to taste. Peel the cucumbers partially, leaving thin strips of skin going down the entire length of the cucumber. Trim the ends of the cucumbers and cut each cucumber into 1-inch thick slices. Scoop out the center of each slice with a melon baller, leaving a shell of flesh. 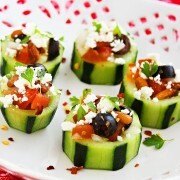 Scoop about 1 tablespoon of the Mediterranean salad into the cucumber cups. Garnish with additional parsley and feta, if desired. « Spring Giveaway with Sokenbicha Tea! Other than how fantastic these look is the fact that you can indulge without feeling guilty! Oh my goodness, I can’t believe I won! =) Thanks so much! And I’m off to check out your guest post now! Those look fantastic, and congrats to the winners! Btw, I tried your chocolate syrup recipe for my bday and posted about it, I LOVED it!! I love Mediterranean flavors, I can’t wait to see the recipes! These look absolutely gorgeous. Going over to check them out at Jen’s. Hope you have a wonderful day. Lovely appetizers, popping over for the details now! They’re so cute! I love the combination of flavors, too. When you read my email you will see how excited I am..I still can’t believe that I won..Thank you, thank you so much!!! Your little cups look absolutely amazing..very pretty! That is such a lovely introduction Georgia! Thank you so much for your kind words and for rescuing me today. I’m incredibly grateful to you! These look delicious! 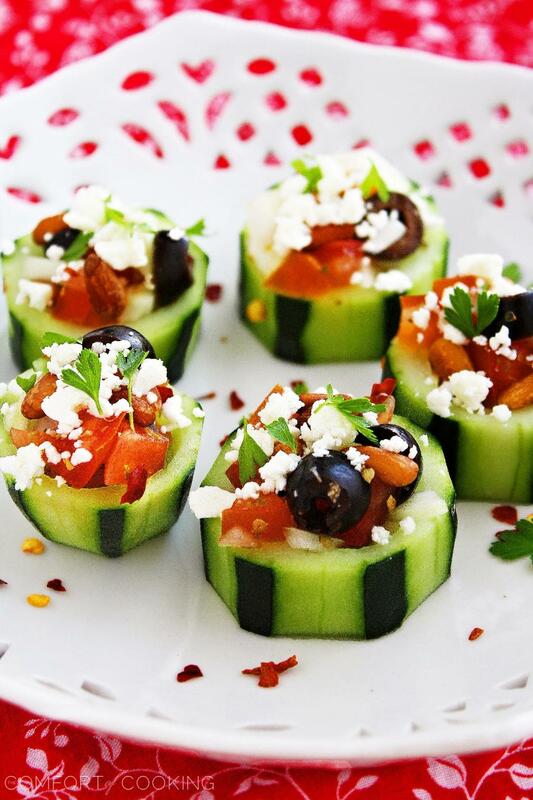 It’s really perfect to use the cucumber cups for a mediterranean mix! Jen does create some really nice dishes. Heading there now! Just came back from your guest post. I love cucumbers but never made cups out of it. You always have some easy but “looks fancy” recipes that I can use for parties or of course regular dinner. =) Pinning and will try one day! These look like a great little appetizer! Jen has a great site, great to see you guys joining forces! Beautiful little munchies! Love the flavors. Congrats to your winners! I’ll take 5, please. Love the flavors. What an awesome idea you had here!!!!! These little cucumber cups are so versatile and look absolutely amazing. Very nice idea with the mediterranean mix. These cucumbers look sophisticated yet easy to make! Thanks! This looks like an easy and yet elegant dish. Love it. this is so cute and adorable. 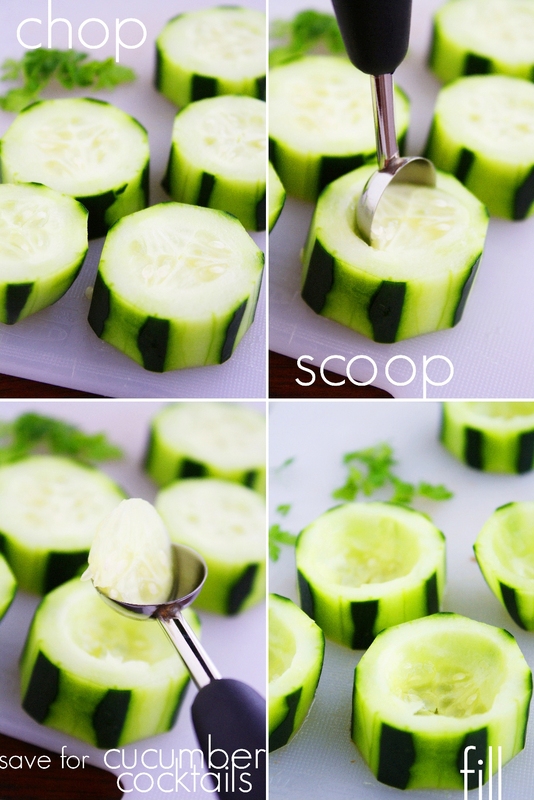 love the idea of scooping out the stuff from the cucumbers. This is the perfect appetizer! Tasty and healthy! A lovely appetizer! Congrats to the winners. THese sound like the perfect healthy delicious appetizers! Off to check out the recipe! What a great and healthy substitution for toast points or crackers! So fantastic! Thanks Georgia :) Going to Jen’s blog now to check out these scrumptious cucumber cups! These are absolutely gorgeous! Love the Mediterranean flair too. I saw your post over at Jen’s blog yesterday–I love how this appetizer looks! I would absolutely make this. So happy to discover your gorgeous blog through Jen’s wonderful blog! Great guest post. Looking forward to following you! These look gorgeous, thank you for sharing the recipe. So refreshing and fun these are. That Mediterranean cups looks so delish and colorful! I love these! I am working on an excellent cucumber recipe and I can’t get enough of cuces! So delicious and easy! Thanks for sharing! Those are the cutest little cups I’ve seen!